1844-? 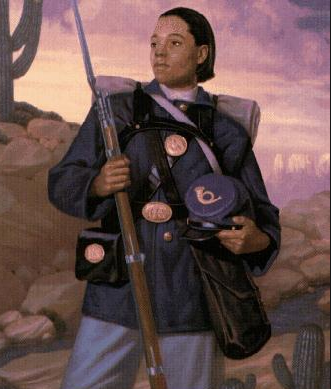 Cathay Williams was the only known female African American Buffalo Soldier. She was the first black woman to be documented for her service in the U.S. Army before women were officially allowed to enlist. Williams was born in September of 1844 in Independence, Missouri. Aside from this lone fact, details of her life up until her enlistment in the Army are unknown or based on rumor. It has been reported that, while her father was a free black man, her mother was a slave and Williams herself was born into slavery. She appears to have been considered the property of William Johnson, an affluent farmer. As a child, Williams was moved to Johnsons home in Jefferson City where she worked as a domestic servant. At the onset of the Civil War, Union soldiers seized the farm, and the 16-year-old Williams was absorbed into the migrations of the Union Army. She was taken to Little Rock, Arkansas, where she worked for the Army as a laundress and a cook. Williams traveled with the Army throughout the south. After briefly working as a cook and laundress in Louisiana, she was placed in the service of General Phillip Sheridan. Under his charge, she experienced life on the front lines as his troops marched on the Shenandoah Valley In her time as an Army servant, Williams witnessed several battles, and watched soldiers burn cotton fields and a Confederate gunboat in the Red River at Shreveport, Louisiana. In the aftermath of the Civil War, Congress developed the first all­ black military units, which later came to be known as “Buffalo Soldiers.” The audacious Williams traveled to St. Louis in 1866, and joined the Army under the guise of a man. Women were not allowed to join the Army at that time, although some had secretly fought in the Civil War. Prospects for black women at that time were grim, and because of her familiarity with the routine, posing as a man in the Army offered Williams a relatively secure existence. When she registered for the 38th Infantry Regiment, she used the alias William Cathey. The misspelling of the surname was due to her own illiteracy. Her enlistment papers, some of the few written records of Williams’ life, indicate that a medical exam determined her fitness for duty and gave her age as 22. Within her unit, no one knew she was a woman except a cousin and a close friend, both of whom guarded her secret with the utmost loyalty. While serving as a Buffalo Soldier, Williams learned to use a musket, and to perform garrison duty, guard duty, and scouting missions. Although no records imply that she was an exceptional soldier, every indication exists that she was perfectly capable. She never had cause to personally engage in combat during her enlistment. In April 1867, Williams and her 75-strong troop marched to Fort Riley in Kansas where along with 15 other privates, she was admitted to the hospital with “Itch,” a term for the ailments that stemmed from camp life that included lice, scabies, and other skin disorders. During Williams’ service in the Army, she spent time at four different post hospitals for various illnesses, and it was apparently never discovered that she was a woman. After the hiatus at Fort Riley, Williams and her company marched 536 miles and arrived at Fort Union, New Mexico, on July 20, 1867. In October of the same year, they were dispatched to Fort Cummings in New Mexico where they served as protection from the Native American raiders on behalf of settlers and miners. Williams was stationed at Fort Cummings for eight months, During that time, many immigrants were traveling to California through New Mexico, and Cooke’s Canyon in the Fort’s territory was one of the most dangerous routes. There are records that a mutiny of some kind broke out within the ranks, but Williams is not listed among those involved in any insubordination. In the winter of f 868, Williams was twice treated for rheumatism in the post hospital at Fort Cummings. By the time the regiment moved to Fort Baynard, New Mexico, in July of 1868, she was still suffering from some kind of illness and was frequently unable to report for duty. On October 14, 1868, she was honorably discharged by a surgeon for her disability for vague reasons and a nervous system disorder. She later implied that she might have admitted her gender to the surgeon in a bid to receive her discharge. Williams dropped her alias and returned to dressing as a woman after her discharge from the Army. She began to work again as a cook and a laundress, first at Fort Union, then in Pueblo, Colorado, and later in Trinidad, Colorado. In 1875, it was discovered that Williams had been an African American woman solider. A journalist from St. Louis recorded her story as told in her own words, and published the tale of her deception and dutiful service the following year. After a brief tenure in Raton, New Mexico, Williams returned to Trinidad. She once again suffered serious illness in 1889. Poor, she petitioned for benefits as a veteran. Her pension and benefits were denied, however, after she was examined by an Army surgeon who found her fit, aside from several amputated toes. It was never denied that she had served as a Buffalo Soldier. Williams does not appear on the Trinidad census after 1900, and it is widely assumed that she had died by then. Her story is one among many regarding the African Americans who served as Buffalo Soldiers. Williams exemplifies the myriad ways in which oppressed people, whether impoverished, Black, or both, found cunning ways to survive a difficult period of history Though her career as a soldier was unremarkable, her courage as a black woman remains exceptionally inspiring.